There is a danger to blowing one’s own horn too loudly, but I have to take three minutes and tell you about what I truly feel is one of the greatest sports gifts anyone could give or receive. You can see what I am talking about here at Heritage Sports Art – fantastic, beautiful original artwork of NFL, MLB, NHL, CFL and NCAA college football uniforms past and present. When I say “the greatest sports gift ever”, I realize that’s one heck of a bold statement – yet I stick by it - these gifts as just about as good as it gets. 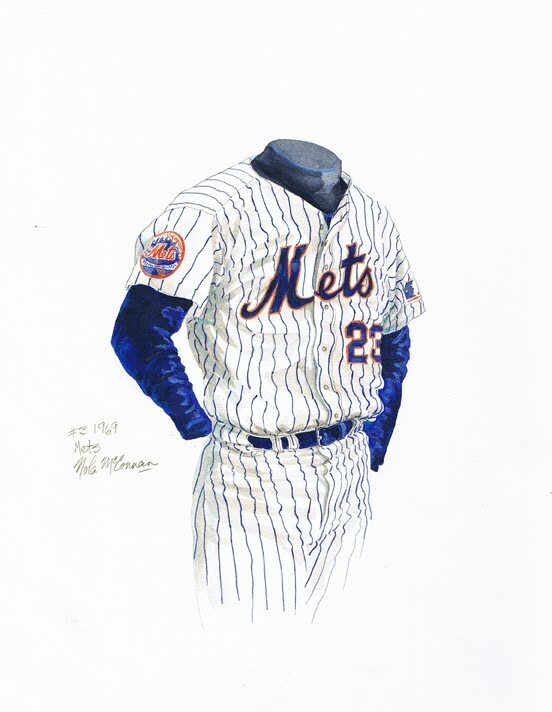 These pieces of original watercolor art celebrate sport and all that's good about sports – they celebrate your favorite team – they are tasteful and attractive – and as I will explain in a moment, they are all “somewhat famous” art. And when I say “gift”, I am thinking that one of these pieces of art, when beautifully framed, would make a remarkable and highly memorable graduation gift, wedding gift, major birthday present (ie a 30th, 40th, 50th or 60th birthday present), anniversary gift, Christmas present, or a gift for achieving a major accomplishment in life. 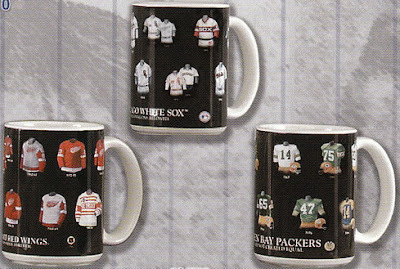 It could even be a gift for your spouse or for your own home or office. You may not yet be convinced, and that’s fine. 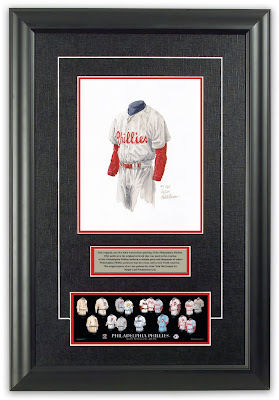 Until you see the art on the Heritage Sports Art website, and until you see it framed, you may not quite grasp how beautiful and unique a gift this artwork is. 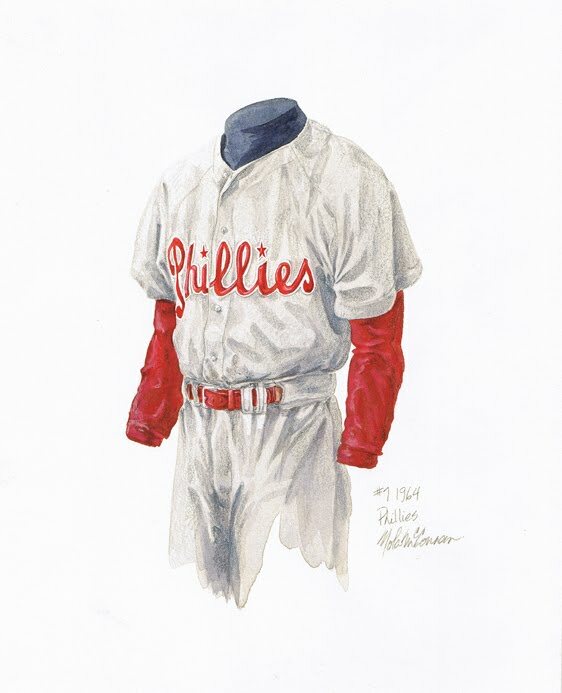 I am talking about is an original watercolor painting of a great uniform that was worn by your favorite team – below please see just four samples of the more than 1500 original pieces of uniform art available for sale at the Heritage Sports Art website. 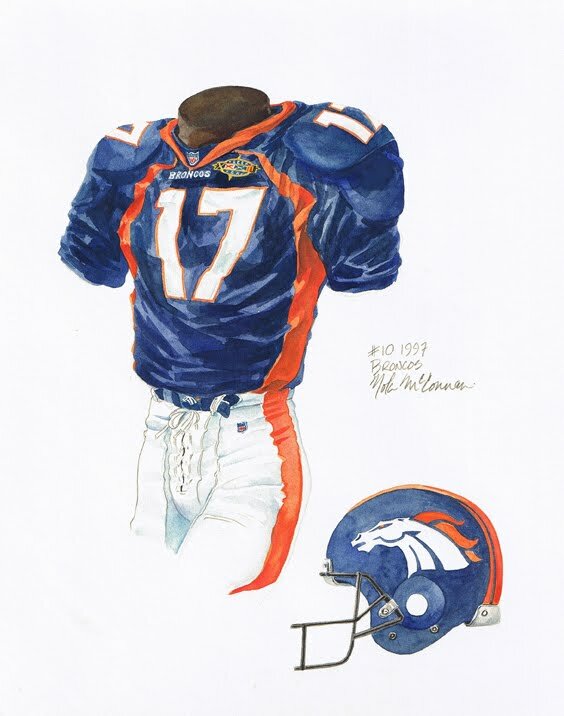 The Heritage Sports Art collection of original artwork contains more than 1500 pieces of original watercolor art including originals for all NFL + MLB + NHL teams as well as 14 of the leading NCAA football teams. In addition to being really beautiful, tasteful art, this is actually “somewhat famous” art. You might well ask – what does Scott mean by “somewhat famous”? What I mean is that this art was used in a huge family of products celebrating the evolution of team jerseys – products such as plaqued posters, framed posters, clocks, coffee mugs, fridge magnets, collector plates, mousepads, playing cards, fan-frames and more. 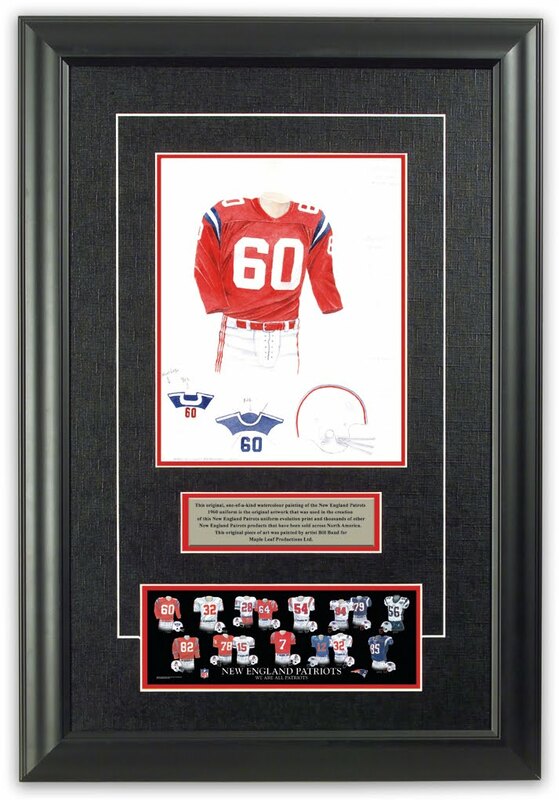 And because the artwork has adorned so many products – almost every piece of art has been seen on tens of thousands, or in some cases hundreds of thousands, of jersey evolution products currently in homes and offices across North America. 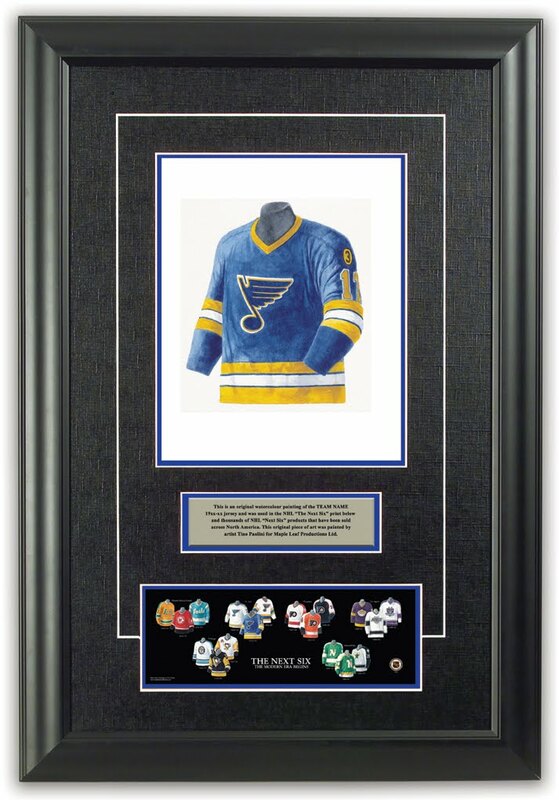 So to reiterate - what Heritage Sports Art is selling is the actual, original, watercolor art used in the manufacture of a large number of great NHL products including the three shown above. 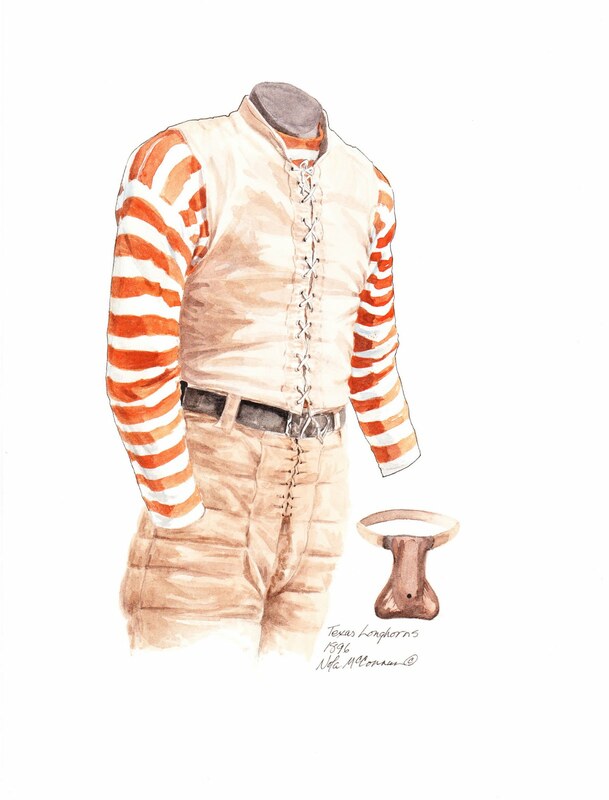 When you buy the 1968-69 Red Wings jersey artwork, for instance, there is only one painting of that jersey in the entire collection and when you buy it, no one else can own that particular piece of jersey artwork. In fact, we only have 16 pieces of Detroit Red Wings jersey artwork in total, and you would own one of them! 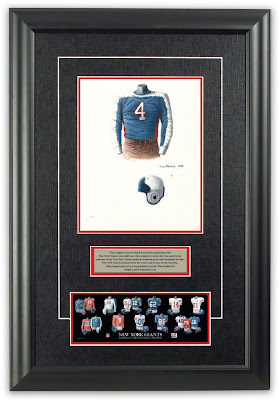 The same goes for the original artwork of the 1934 New York Giants uniform – it’s one of only 16 pieces of Giants’ art in the collection. Or the 1964 Philadelphia Phillies uniform – it’s one of just 17 Phillies' jerseys that we painted. And so on for each of the 1500 original paintings in the collection – each piece of art is absolutely one-of-a-kind, unique and as explained above - somewhat famous. 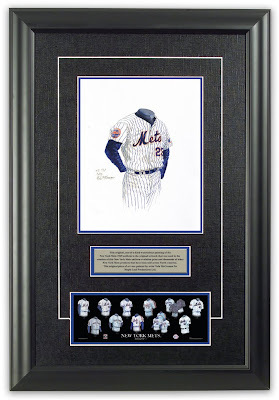 We frame the original art in really attractive manner. 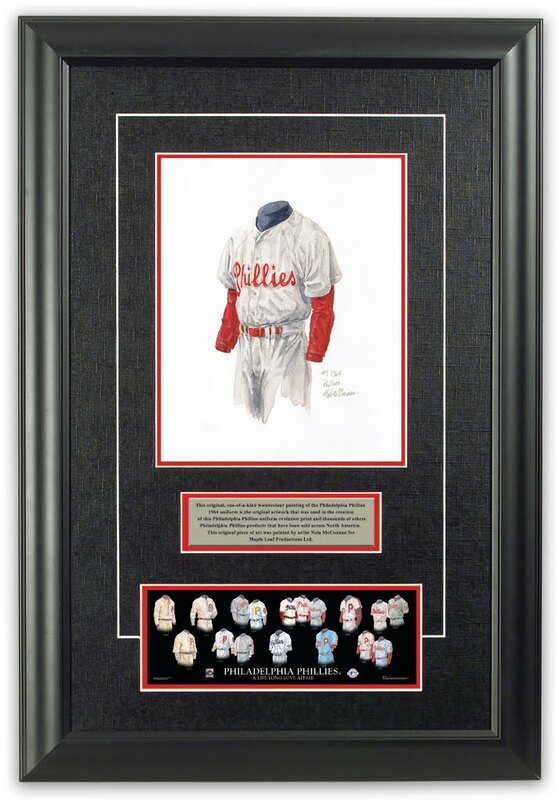 Included in the frame is an engraved plate that tells the story of the art, as well as a jersey evolution poster for that team which shows how that particular original piece of art was used in that team’s jersey evolution poster. This really makes for a highly attractive wall hanging and we continue to be delighted and amazed to hear from people who have bought from us and when they take delivery, they email or call us almost immediately and tell us how it is even more appealing and more attractive than they had thought when they bought it online. And remember, your purchase comes with a 30 day, no-questions-asked, money back guarantee so if you are not 100% completely satisfied with you purchase for any reason, ship it back to us and we will gladly refund your payment. And also, our prices including UPS shipping right to your door. 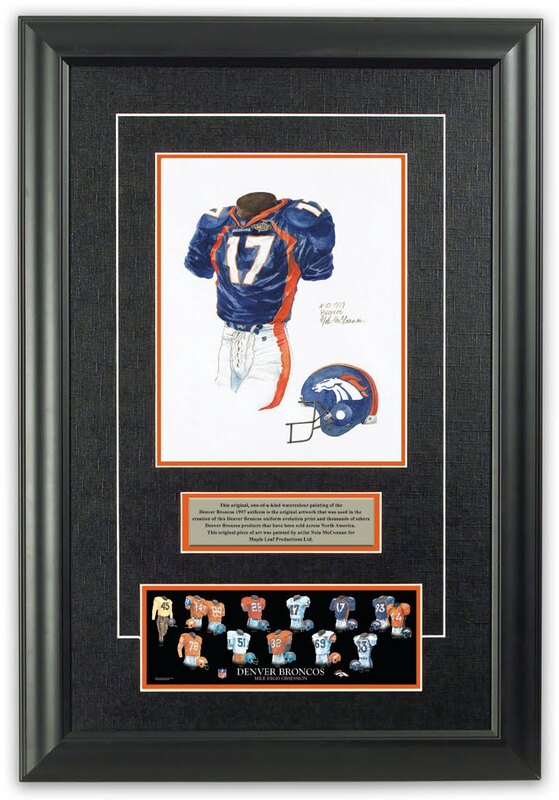 So I would like to encourage you to have a close look at the original art collection at Heritage Sports Art – I sincerely believe are looking at a gift so nice it will become an instant family heirloom. These are so beautiful that you’ll find yourself sneaking downstairs late at night to have another look. This is save-the-family-photo-album-and-then-this-framed-piece-of-art-from-a-fire nice. I don’t like doing a hard sell, it’s not my nature, but keep in mind that since all of the art is original, the sooner you act, the more choice you have. 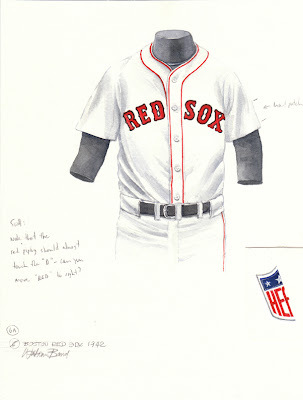 Thank you being a huge sports fan and for reading this blog. If you have any questions, please call me at 416-315-4736 or email me at ssillcox@rogers.com – I’m a real person and I’d love to tell you everything I can about this great art and why it really is “The best sports gift ever”. If you are a huge fan of one of the following NCAA football teams, or if you know a die-hard super-fan, please let me blow my own horn for three minutes. 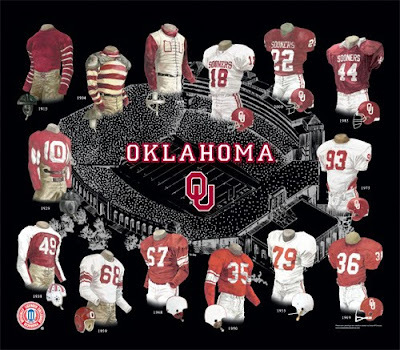 If you see your team listed above, I would like to make sure that you know about what I truly feel is one of the greatest NCAA football gifts anyone could give or receive. 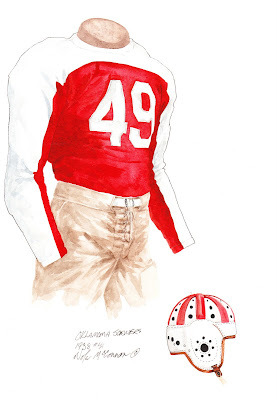 You can see what I am talking about here at Heritage Sports Art – fantastic, beautiful original watercolor artwork of NCAA team uniforms past and present. 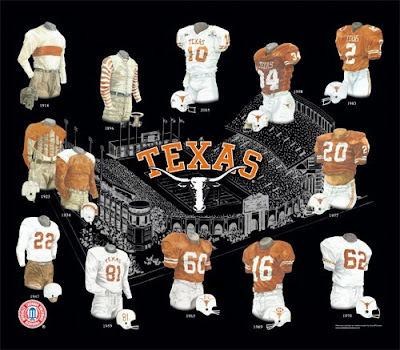 When I say “the greatest NCAA football gift ever”, I realize that’s a very bold statement – yet I stick by the assertion that this really is as good as it gets. 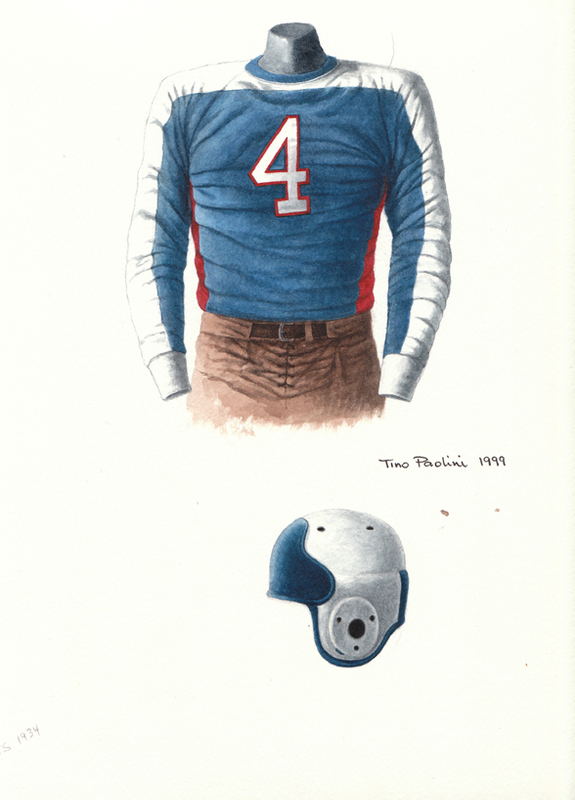 This art celebrates the great sport of US college football – it celebrates your favorite team (if it’s listed above) – it’s tasteful and attractive – and as I will explain in a moment, it’s also “somewhat famous” art. And when I say “gift”, I am thinking that one of these framed pieces of art would make a remarkable and highly memorable wedding gift, anniversary gift, major birthday present (ie a 30th, 40th, 50th or 60th birthday present), graduation gift, retirement gift, Christmas present, or a gift for achieving a major accomplishment. It could even be a gift for your spouse or for your own home or office. You may not yet be convinced, and that’s fine. 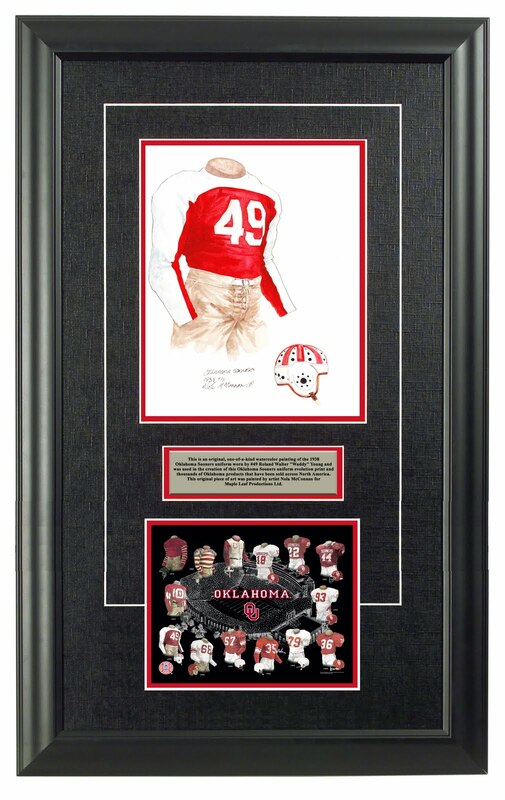 Until you see the NCAA football art on the Heritage Sports Art website, and until you see it framed, you may not quite grasp how beautiful and unique a gift this artwork is. 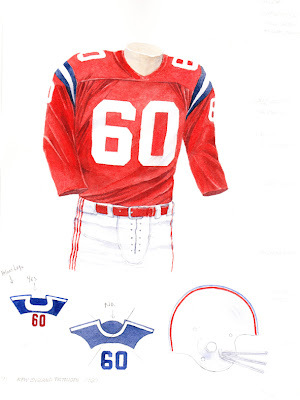 What I am talking about is an original watercolor painting of a great uniform that was worn by one of these storied NCAA football teams – below please see just three samples of the more than 200 originals available for sale at the Heritage Sports Art website. The NCAA football collection of original artwork contains more than 200 pieces of original NCAA football uniform art including jerseys and helmets for all 14 teams listed above. In addition to being really beautiful, tasteful art, this is actually “somewhat famous” art. You might well ask – what does Scott mean by “somewhat famous”? 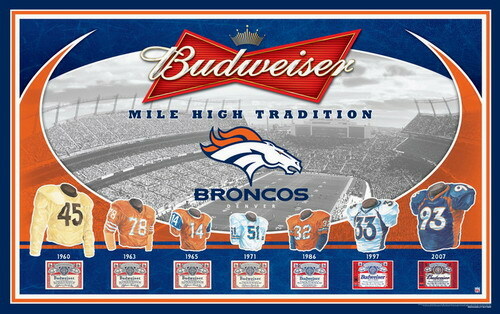 What I mean is that this art has been used, and will continue to be used in years to come, in and on a huge family of products celebrating the evolution of team uniforms – products such as plaqued posters, framed posters, clocks, coffee mugs, fridge magnets, collector plates, mousepads, playing cards, fan-frames and more. And because the artwork has adorned so many products – almost every piece of art has been seen on thousands, or in some cases tens of thousands, of uniform evolution products currently in homes and offices across North America. So to reiterate - what Heritage Sports Art is selling is the actual, original, watercolor art used in the manufacture of a large number of great NCAA products including the three shown above. When you buy the 1896 Texas Longhorns football uniform artwork, for instance, there is only one painting of that uniform in the entire collection and when you buy it, no one else can own that particular piece of uniform artwork. 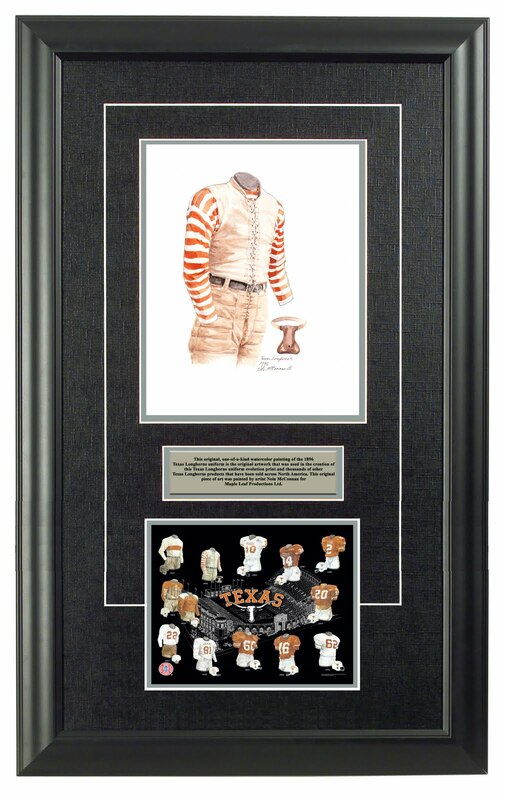 In fact, we only have 13 pieces of Texas Longhorn uniform artwork in total, and you would own one of them! 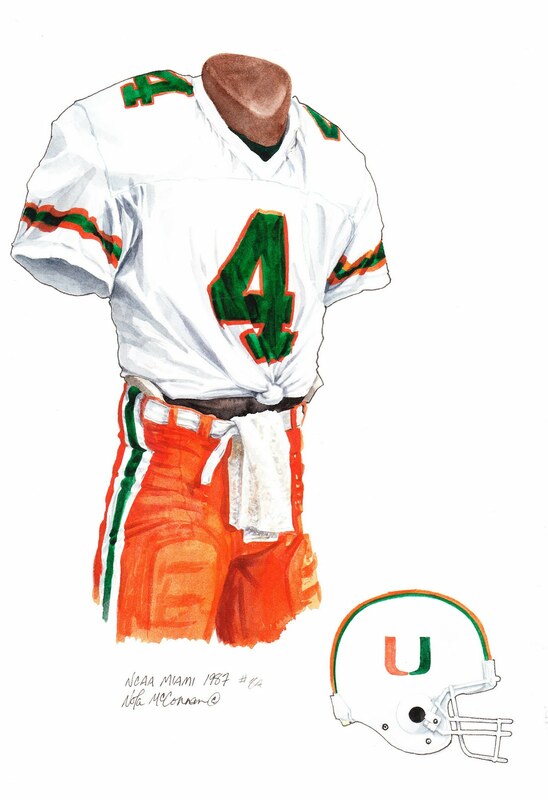 The same goes for the original artwork of the 1987 Miami Hurricanes – it’s one of only 16 pieces of Canes’ art in the collection. Or the 1938 Oklahoma Sooners – it’s one of just 16 Sooners uniforms that we painted. And so on for each of the 200 original paintings in the NCAA football collection – each piece of art is absolutely one-of-a-kind, unique and as explained above - somewhat famous. 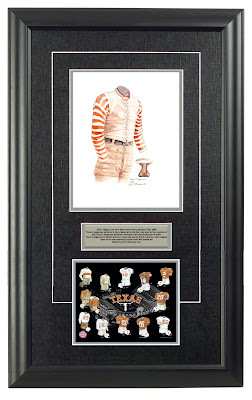 We frame the original art in really attractive manner. 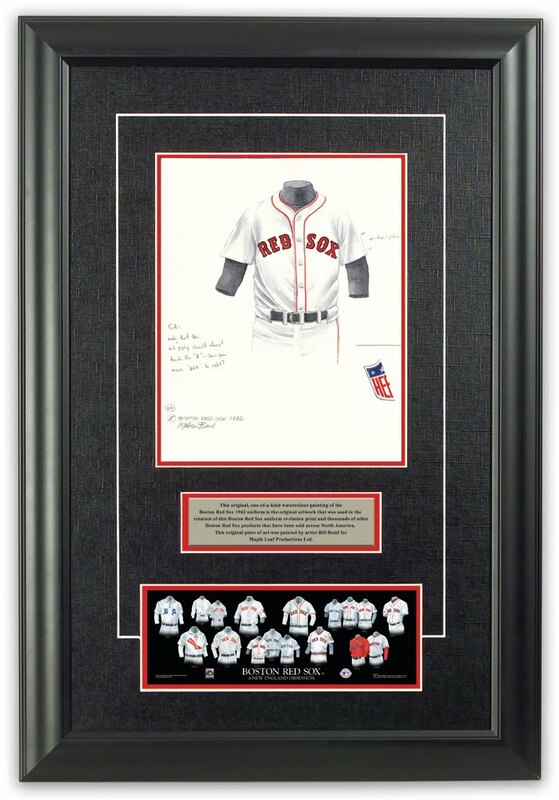 Included in the frame is an engraved plate that tells the story of the art, as well as a uniform evolution poster for that team which shows how that particular original piece of art was used in that team’s uniform evolution poster. This really makes for a highly attractive wall hanging and we continue to be delighted and amazed to hear from people who have bought from us and when they take delivery, they email or call us almost immediately and tell us how it is even more appealing and more attractive than they had thought when they bought it online. And remember, your purchase comes with a 30 day, no-questions-asked, money back guarantee so if you are not 100% completely satisfied with you purchase for any reason, ship it back to us and we will gladly refund your payment. And also, our prices include UPS shipping right to your door. So I would like to encourage you to have a close look at the NCAA football uniform art collection at Heritage Sports Art – I sincerely believe are looking at a gift so nice it will become an instant family heirloom. 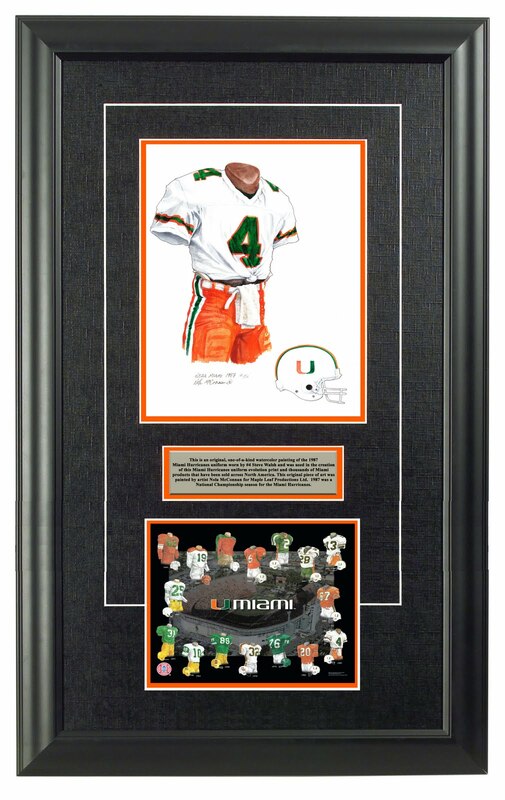 This is such a nice piece of framed NCAA art and history that you’ll find yourself sneaking downstairs late at night to have another look. This is save-the-family-photo-album-and-then-this-framed-piece-of-art-from-a-fire nice. I don’t like doing a hard sell, it’s not my nature, but keep in mind that since all of the art is original, the sooner you act, the more choice you have. Thank you being a huge college football fan and for reading this blog If you have any questions, please call me at 416-315-4736 or email me at ssillcox@rogers.com – I’m a real person and I’d love to tell you everything I can about this great NCAA art and why it really is “the best NCAA football gift ever”. There is a danger to blowing one’s own horn too loudly, but I have to take three minutes and make sure that you know about what I truly feel is one of the greatest NHL gifts anyone could give or receive. 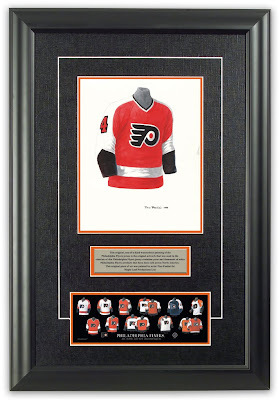 You can see what I am talking about here at Heritage Sports Art – fantastic, beautiful original artwork of NHL team jerseys past and present. 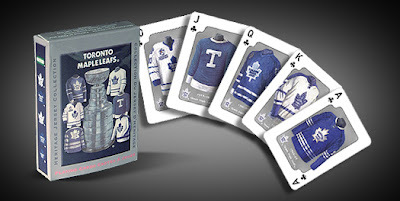 When I say “the greatest NHL gift ever”, I realize that’s a very bold statement – yet I stick by the assertion that this really is as good as it gets. 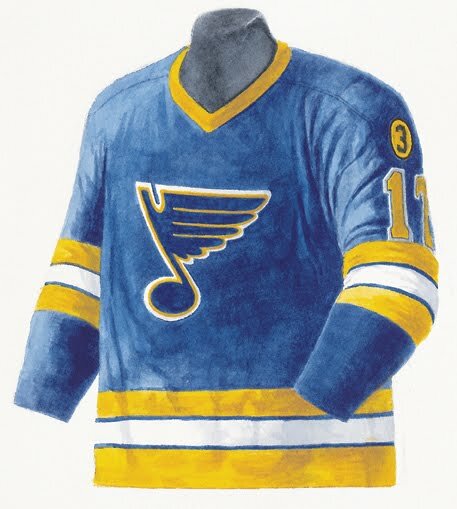 It celebrates the great sport of hockey – it celebrates your favorite team – it’s tasteful and attractive – and as I will explain in a moment, it’s also “somewhat famous” art. And when I say “gift”, I am thinking that one of these framed pieces of art would make a remarkable and highly memorable wedding gift, Christmas present, major birthday present (ie a 30th, 40th, 50th or 60th birthday present), anniversary gift, graduation gift or a gift for achieving a major accomplishment. 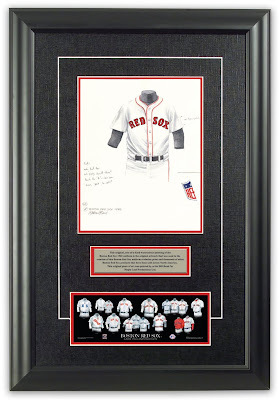 It could even be a gift for your own spouse or for your own home or office. 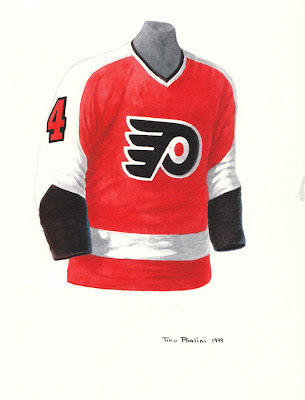 I am talking about is an original watercolor painting of a great jersey that was worn by your favorite NHL team – below please see just three samples of the more than 350 originals available for sale at the Heritage Sports Art website. The NHL collection of original artwork contains more than 350 pieces of original NHL jersey art including originals for all 30 NHL teams. In addition to being really beautiful, tasteful art, this is actually “somewhat famous” art. You might well ask – what does Scott mean by “somewhat famous”? What I mean is that this art was used in a huge family of products celebrating the evolution of team jerseys – products such as plaqued posters, framed posters, clocks, coffee mugs, fridge magnets, collector plates, mousepads, playing cards, fan-frames and more. 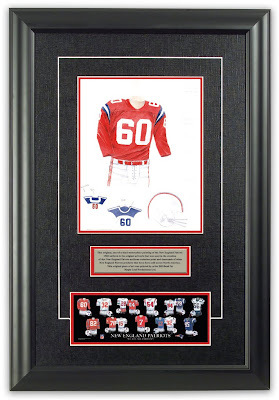 And because the artwork has adorned so many products – almost every piece of art has been seen on tens of thousands, or in some cases hundreds of thousands, of jersey evolution products currently in homes and offices across North America. 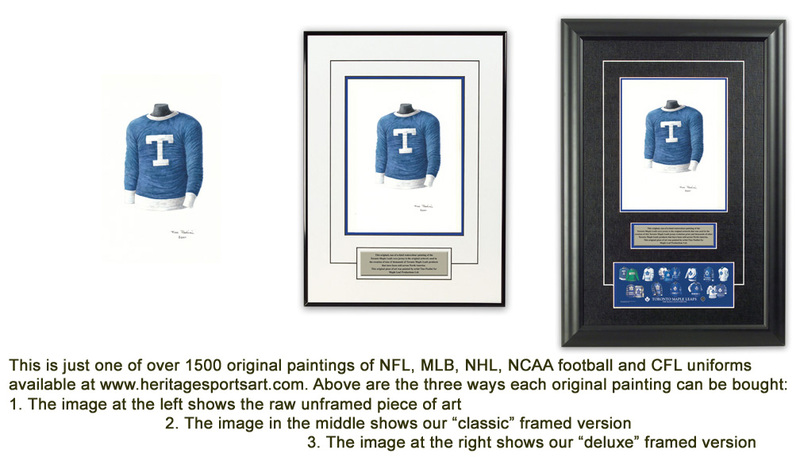 So to reiterate - what Heritage Sports Art is selling is the actual, original, watercolor art used in the manufacture of a large number of great NHL products including the three shown above. 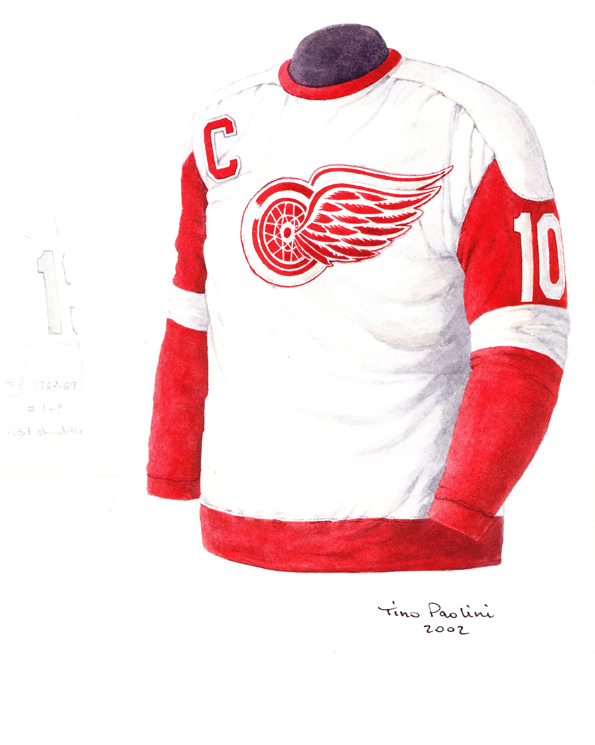 When you buy the 1968-69 Red Wings jersey artwork, for instance, there is only one painting of that jersey in the entire collection and when you buy it, no one else can own that particular piece of jersey artwork. 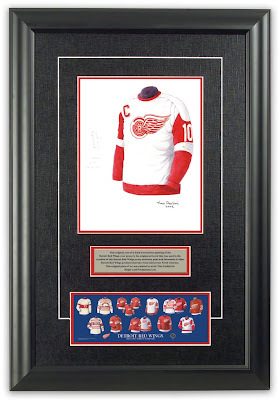 In fact, we only have 16 pieces of Detroit Red Wings jersey artwork in total, and you would own one of them! The same goes for the original artwork of the 1974-75 Philadelphia Flyers – it’s one of only 14 pieces of Flyers’ art in the collection. Or the 1973-74 St. Louis Blues – it’s one of just 17 Blues jerseys that we painted. 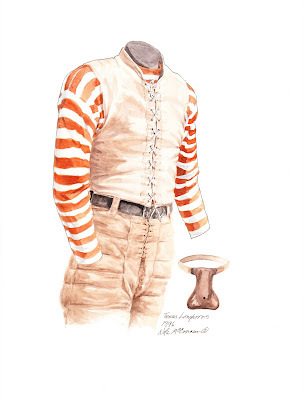 And so on for each of the 350 original paintings in the NHL collection – each piece of art is absolutely one-of-a-kind, unique and as explained above - somewhat famous. We frame the original art in really attractive manner. Included in the frame is an engraved plate that tells the story of the art, as well as a jersey evolution poster for that team which shows how that particular original piece of art was used in that team’s jersey evolution poster. This really makes for a highly attractive wall hanging and we continue to be delighted and amazed to hear from people who have bought from us and when they take delivery, they email or call us almost immediately and tell us how it is even more appealing and more attractive than they had thought when they bought it online. And remember, your purchase comes with a 30 day, no-questions-asked, money back guarantee so if you are not 100% completely satisfied with you purchase for any reason, ship it back to us and we will gladly refund your payment. And also, our prices include UPS shipping right to your door. 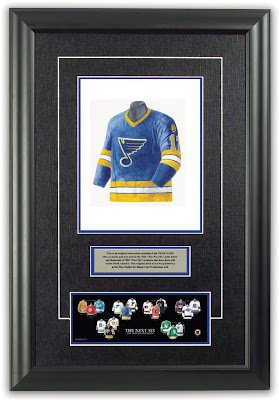 So I would like to encourage you to have a close look at the NHL art collection at Heritage Sports Art – I sincerely believe are looking at a gift so nice it will become an instant family heirloom. This is such a nice piece of framed NHL art and history that you’ll find yourself sneaking downstairs late at night to have another look. This is save-the-family-photo-album-and-then-this-framed-piece-of-art-from-a-fire nice. I don’t like doing a hard sell, it’s not my nature, but keep in mind that since all of the art is original, the sooner you act, the more choice you have. 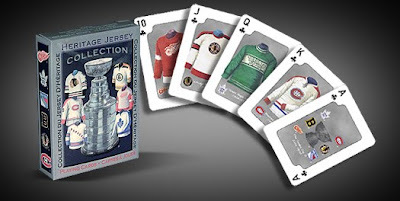 Thank you being a huge NHL fan and for reading this blog If you have any questions, please call me at 416-315-4736 or email me at ssillcox@rogers.com – I’m a real person and I’d love to tell you everything I can about this great NHL art and why it really is “the best NHL gift ever”.